The big sister does it all well. The little sister waits. She wants to be a star, too. Is there a child alive who doesn't sometimes feel that no one notices them? Every single child and it seems especially in this day and age needs to have someone tell him/her/them over and over and over again how very, very special they are. How unique they are. How they are made of really special stuff. Their basic building blocks are fantastic, amazing, phenomenal and those building blocks make them who they are. Enter Jeanne Willis and Briony May Smith. They have stepped into the shoes of a young girl whose big sister gets all the spotlights. That big sister finds the lost ring that Mom is searching for and knits the best scarf. You know the feeling. This younger sister is over there in the shadows wishing and waiting and hoping for her moment ..make that her moments... in the light. She needs to feel special, too. Luckily, this girl has a grandfather who sees her. He feels how special she is and he understands that she needs to really "get" who she is. He takes her on a journey that every child deserves and now, through this beautifully illustrated story, every child can take. 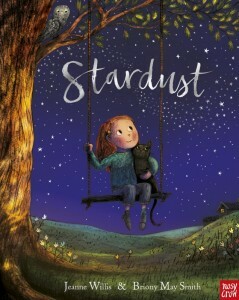 There's a power to this book because it connects each young listener to the enormous power and love that is in the universe and it says to each one, "You are made of this same stuff." If you read Marion Dane Bauer's THE STUFF OF STARS, you know the sweeping feeling of Ekua Holmes' out of this world illustrations. We're in that ballpark but a bit more with a child's eye view. The illustrations in this story have a power all their own. Imagine walking back in time holding the hand of your grandfather who you love and trust and admire. Imagine watching the brilliant stars and planets and mountains and seas being born and experiencing together that incredible mystery and wonder. That's the story you have before you. Yes, it's that good. So, get ready for an adventure into the wonder of the world we live in and prepare yourself for the astonishing realization of how incredible it is that you are part of the wonder. You are a building block of the wonder. You carry all of this stardust in your self and you shine. An important book for now when many of our children are looking for a pathway out of darkness.